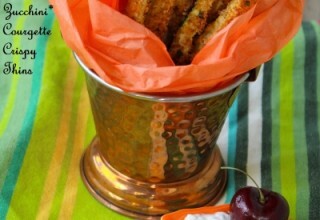 A Perfect Bite Size Appetizer for parties, patios and get-togethers! The spring has sprung! The weather is getting better, the days becoming longer and everyone seems to be in a great spirit. 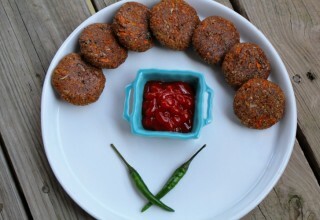 Gone are the winter stews, soups and big dinners and in come the salads, springtime vegetables and outdoor get-togethers and parties. 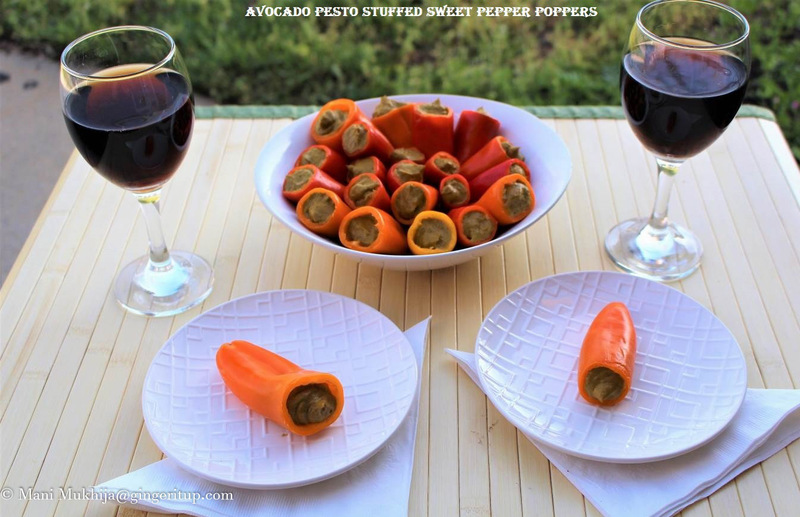 A platter of Sweet Pepper Poppers compliments perfectly to the patio season, fresh breeze along with your favorite wine. 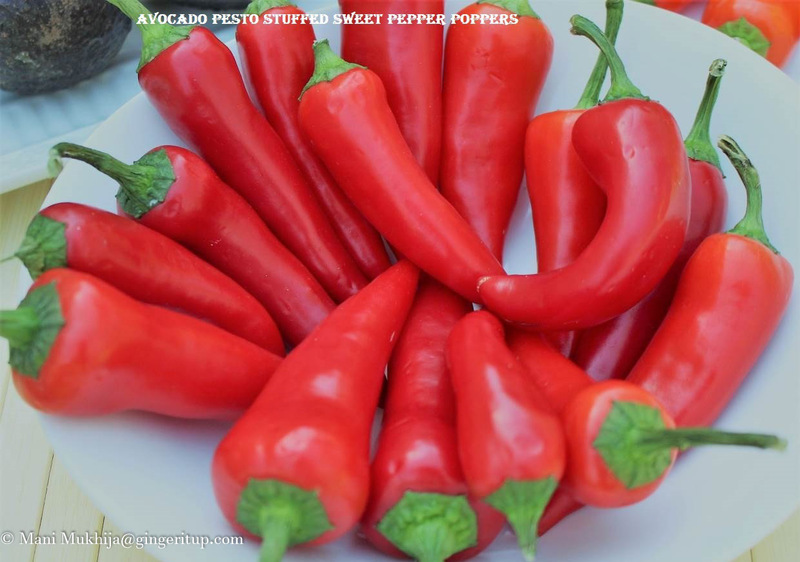 The freshness of avocado, the just perfect Char-flavor of roasted roma tomatoes, mangoes and Fresh Hot Red Chile stuffed inside these vibrant li’l sweeties and served with your favorite wine calls for an addicting appetizer treat. 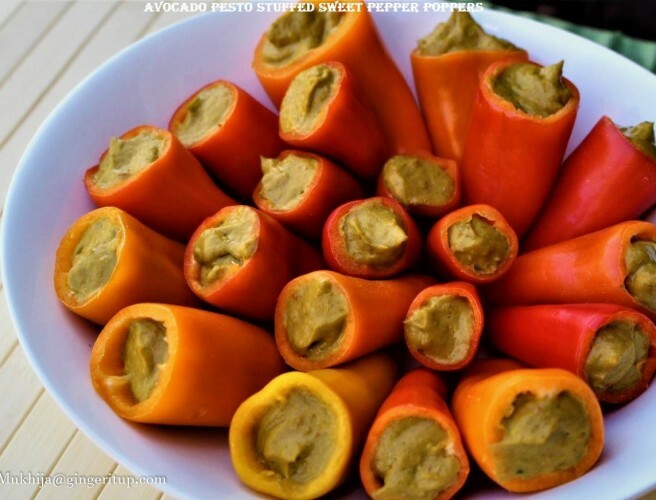 Your friends are simply going to fall in love with this Sweet Pepper Popper treat. 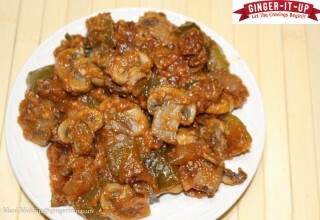 So, if you are looking for a guilt free healthy appetizer to enjoy your evening, this Sweet Pepper Popper is a must try. Last week, when I saw these li’l sweeties in the grocery store, I instantly knew what to do with them. 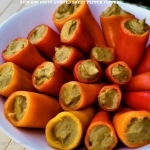 The Mother Nature has given us so many colors in forms of these vegetables and fruits. 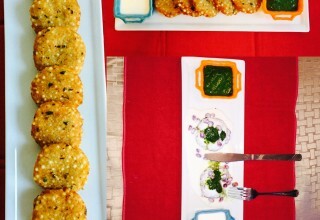 When we bring them all together in the kitchen, a vibrant and delicious recipe is sure to come out. 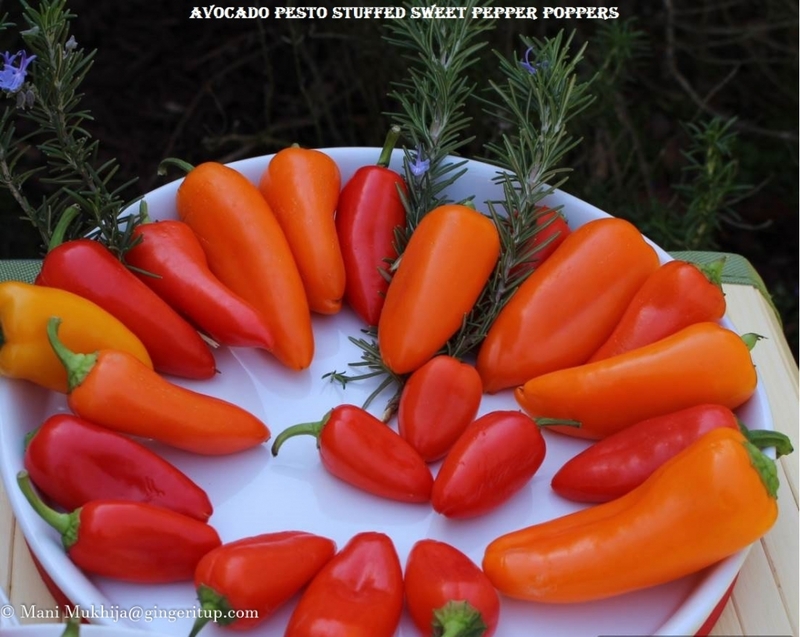 So, I decided to combine my mini sweet peppers with more colors from the nature and therefore bought the fresh hot red chili peppers and avocadoes to be its companions along with a few more ingredients from my pantry. The first thing I prepared was a chunky hot & sweet pesto with Roma tomatoes, rosemary, red chili pepper and chunks of mango. 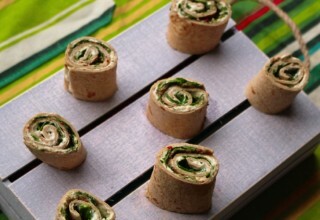 I tossed them all together with olive oil and placed them on a baking sheet. 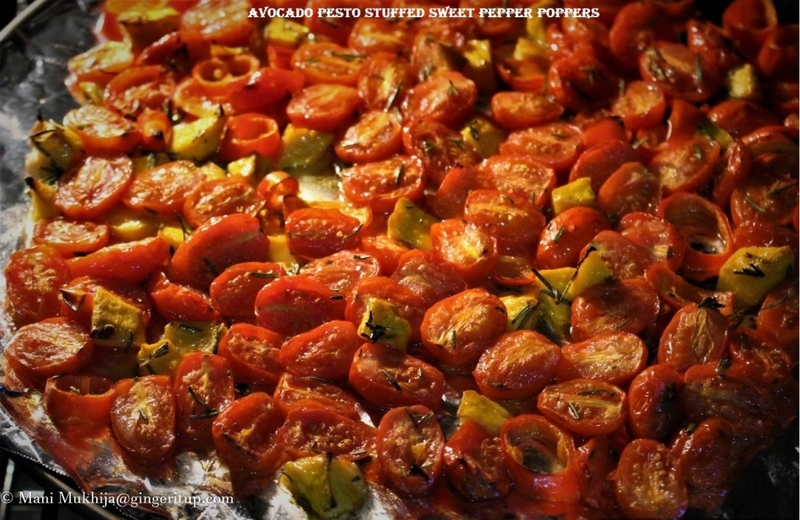 The kitchen became so aromatic the moment I roasted them together in the oven to get the perfect Char-flavor. The fragrance of rosemary was all over. I just roasted it for 4-5 minutes to ooze their flavors out. 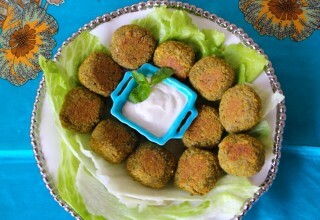 Once, everything cooled down, I crushed them in the blender with cilantro and salt to get that perfect pesto. 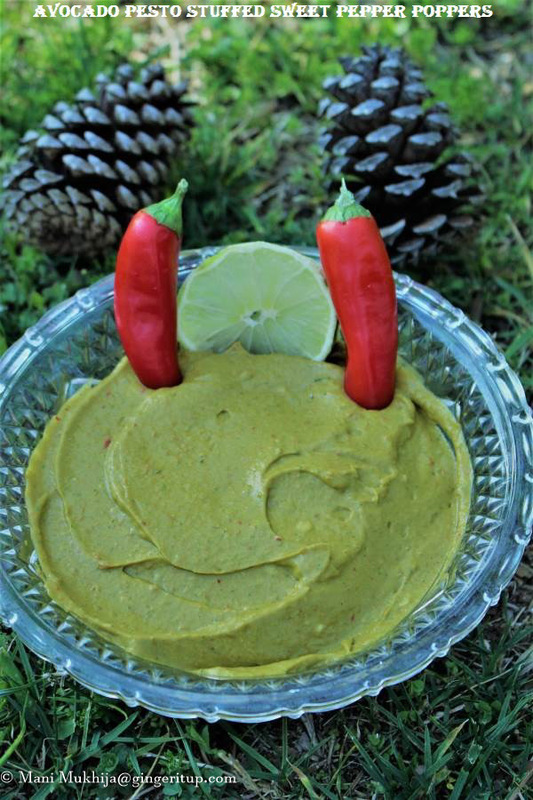 Next thing I did was to mash the avocadoes and mix it with the pesto to prepare a creamy Avocado Pesto. 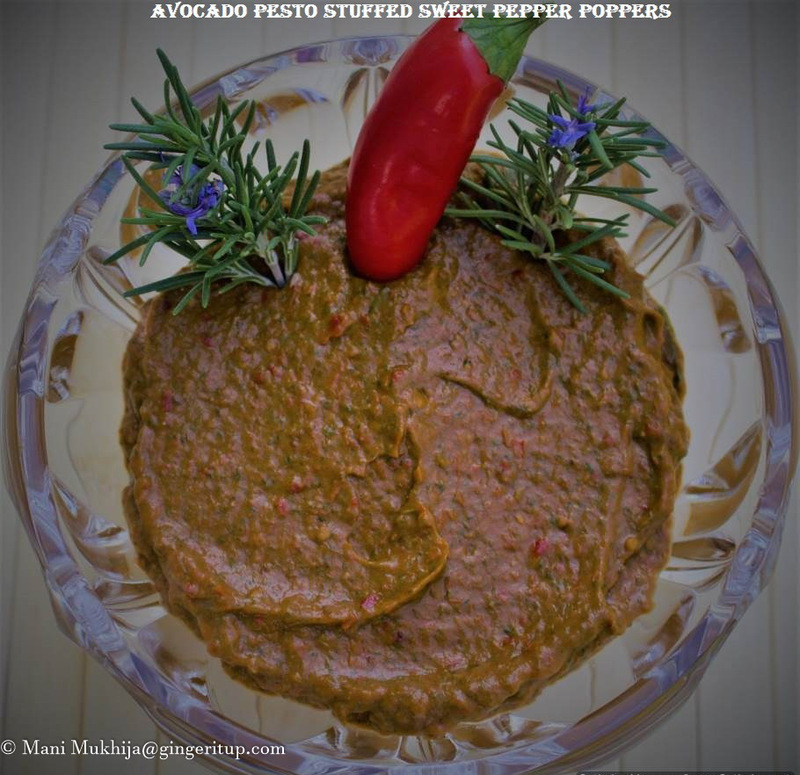 Last thing was to fill this flavorful Avocado Pesto into my cute mini sweet peppers. I did that easily with the help of a ziplock bag. 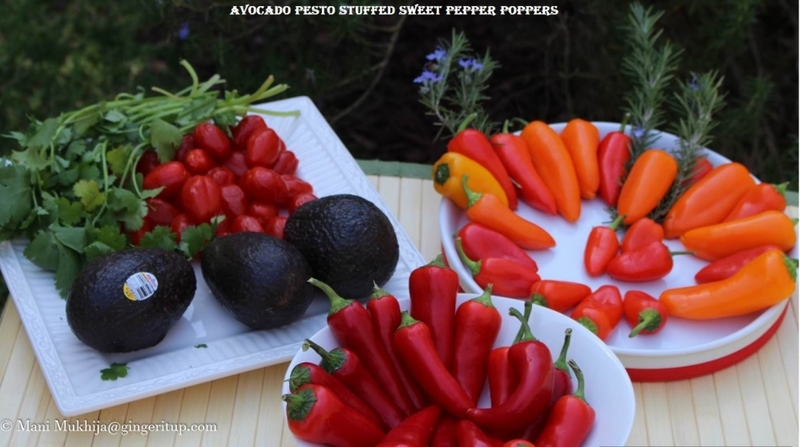 Simply filled the ziplock bag with the avocado pesto and snipped at one corner to fill in my sweet peppers. 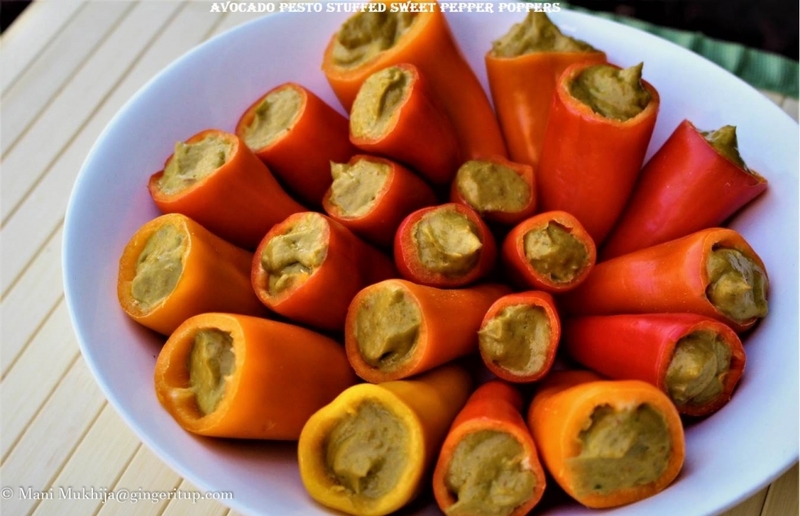 The delightful sweet pepper poppers stuffed with healthy avocado pesto is ready in no time. 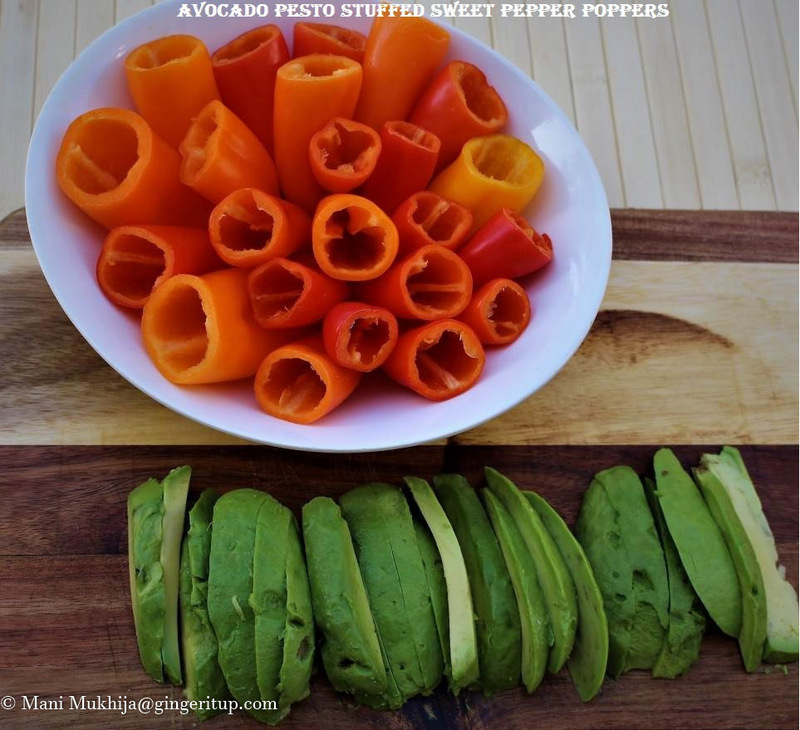 Cut the stems off of the peppers and remove the seeds using a spoon. 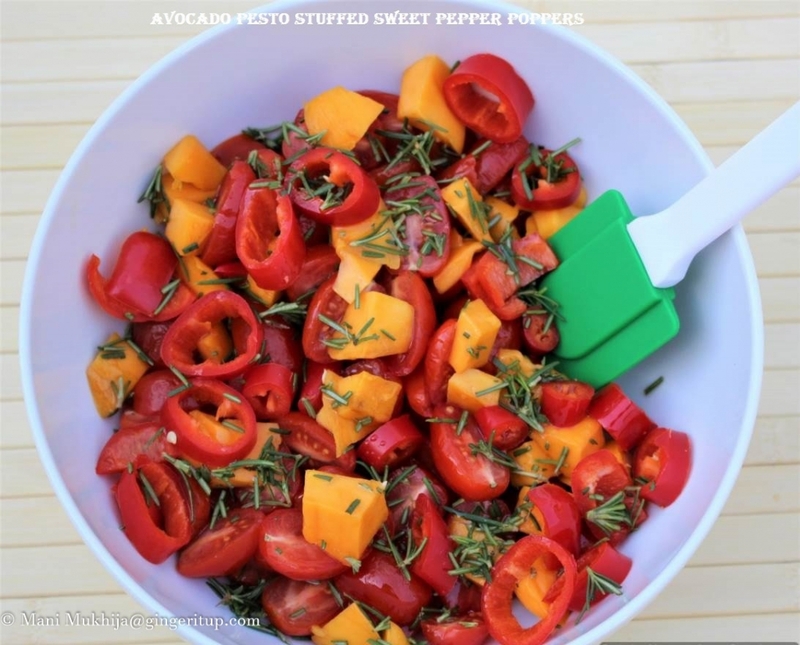 In a bowl, take tomatoes, mango chunks, rosemary and red chili peppers. Drizzle olive oil and mix well. 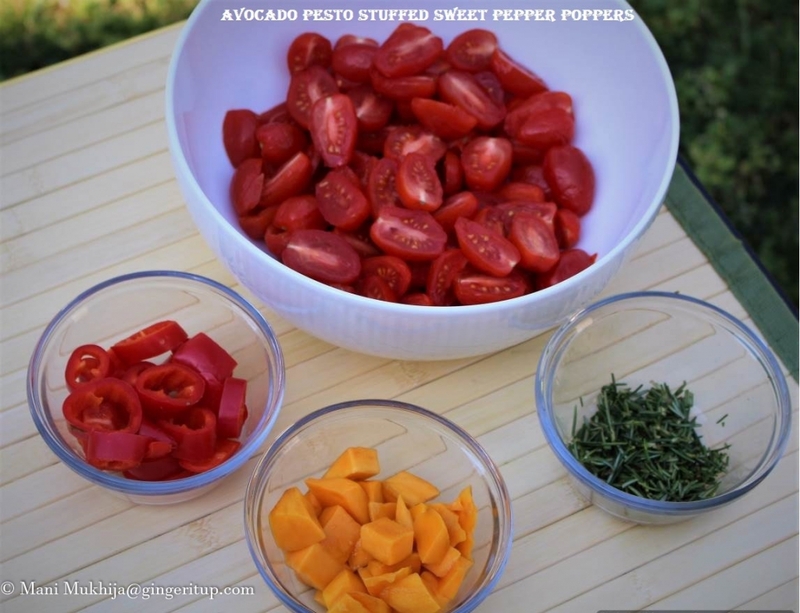 Place it on a baking sheet and roast it for 4-5 minutes or roast it using a grill to get the Char-flavor. Don’t over roast it. 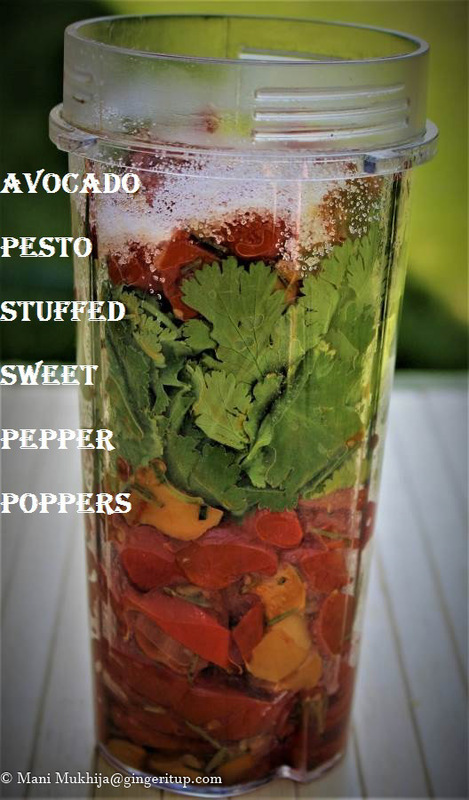 Once cooled, transfer into a blender along with cilantro and salt to puree into a pesto. With a fork (or in a food processor) mash up the avocados and pesto until creamy. Add a pinch of salt. Using a big ziplock bag with the corner snipped off, pipe the mixture into mini sweet bell peppers .Serve as an appetizer or side dish along with wine or your favorite drink.